Well, this is my crush food. Bánh xèo (pronounced bahn say-oh, and meaning “sizzling cake”) is simply the epitome, the apogee, of my culinary wish list: crunchy yet soft, sour-salty, umami and faintly sweet. With lovely crispy lace edges if I get it right (not crucial, but oh so satisfying) How it manages all these tick boxes I don’t know, but it does. And it is just as good made vegan. In fact, I prefer it without the traditional pork and prawns. I’ve gone all fangirl for this dish, first tasted properly a number of years ago in a London cafe (since gone downhill, I understand). I wanted to write a thank you letter/fan letter after sighing and mmming my way through my first proper one. That crepe was the Donny Osmond (circa ’74) of the food world for me. I have since had it in Vietnamese restaurants in Edinburgh – all very nice – but thought I better start making my own as my dilated eyes and table thumping were getting a bit embarrassing. When I first embarked on doing my take on this recipe I was shocked to find that the crepe contains no egg. The yellow of the turmeric fools you into thinking that henny pennies have been involved, but no. It is pretty straightforward to put together, and I would stick out my neck and say that it is family-friendly – making smaller ones as required (or nicking half of a big one and giving the rest to said child). As with all pancakes, the first one is often a duffer, but learn from the first one (mine is usually lop-sided and a bit thick -no comments please). I won’t detain you further from this recipe. I hope you aren’t too put off with the long ingredient list and my usual pedantic hand-holding instructions. It really is quite straight-forward for the semi-experienced home cook. Of which I am one. Connoisseurs of Vietnamese food (and indeed any Vietnamese reading this) may be somewhat taken aback by my version, but I hope you like the sound of it. It is loaded with vegetables and herbs (hence the over-stuffed in the title), with some optional options to cut time. So, what’s YOUR food crush? Please, please don’t be put off by the long list of ingredients. Nor by my long-winded pedantic instructions. 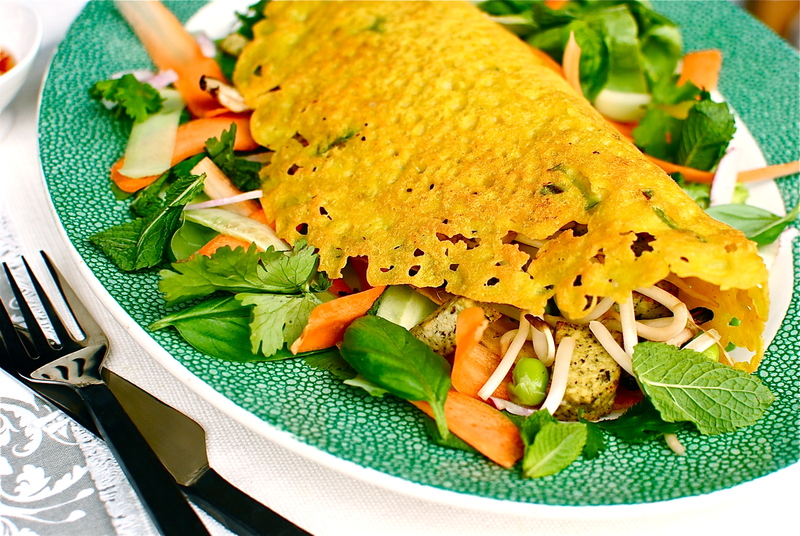 These veganised Vietnamese crepes – or bánh xèo (pronounced bahn say-oh) – are really easy to make, and even easier to eat. The key is to have everything chopped and waiting. You can make the batter and dipping sauce ahead of time (even overnight) and fry up when you are ready. They are best freshly made and served as they come out of the pan, but are perfectly fine with a brief spell in a low oven. Non-vegans/vegetarians may like to use prawns or a combination of prawns and tofu. Traditionally, pork and prawns are used (as well as less vegetation – I go a bit wild), but these crispy yet moist crepes are so flavourful that even confirmed meat eaters will not miss the meat. This recipe is influenced by numerous recipes, including this one from theKitchn. Herb Salad ‘Bed’: 1 round/butter lettuce, leaves separated; 1 small-medium cucumber (English), peeled, halved and thinly sliced lengthways; 3 carrots, peeled then ‘shaved’ with a Y peeler, or thinly sliced; 6 radishes, thinly sliced; plenty of washed and dried basil, mint and coriander (about 40g each) – roughly torn. Divide these fresh ingredients between four plates before cooking the crepes and filling. 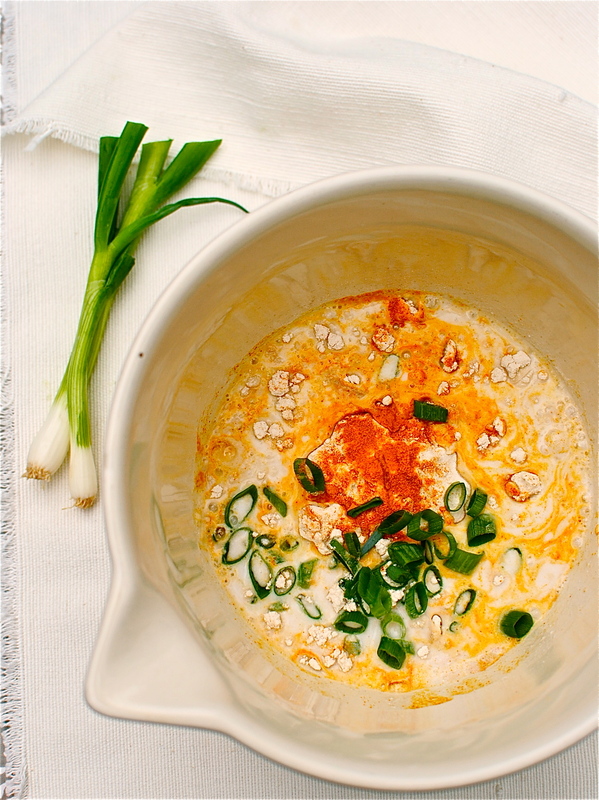 Making the batter: Add the rice flour, turmeric and salt to a mixing bowl (glass or metal). Whisk thoroughly to distribute then pour in the oil and fold in the lime leaves and spring onions. Gradually add the water and coconut milk, whisking constantly as it will quickly become thick. Let this sit while you get on with the filling and dipping sauce. Making the dipping sauce: Mix all together and set aside. The sugar will dissolve on its own. Taste and adjust to your own liking. 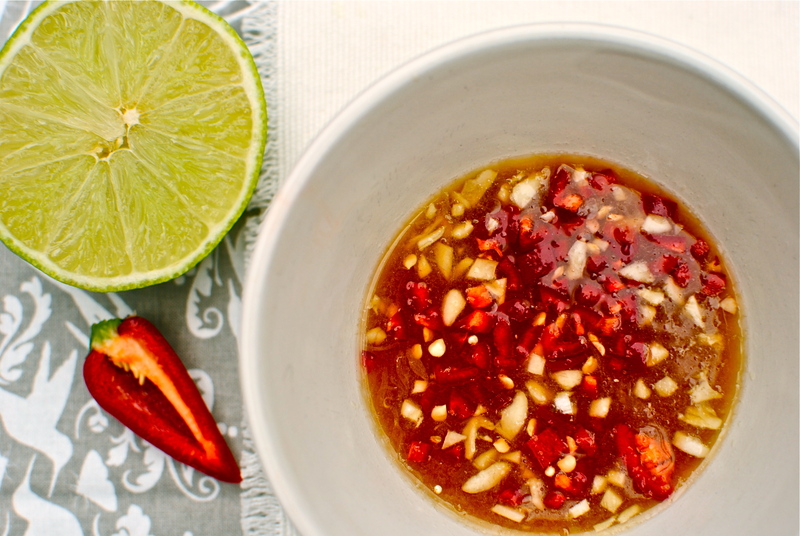 **You could instead dilute down a good garlic-chilli sauce with lime/rice vinegar and water. For serving children, a loosened sweet chilli dipping sauce would be perfect. Making the filling: Heat a tablespoon of oil in a large, heavy frying pan over a low-medium flame. Add the garlic and sliced onion and turn over in the oil. Pop on a lid, if the pan has one, and let the onions soften for two minutes. Add in the sliced mushrooms and tofu, sautéing for a further few minutes, stirring occasionally. Once the tofu has a little colour, stir in the blanched beansprouts and edamame – this will make the filling moister as well as add crunch and pop. Season with pepper and a pinch of sugar; stir, cover and set aside while you make the first crepe. *Tofu can be replaced with prawns or chicken , or a combination of these. Making the crepes: Wipe clean the frying pan then heat 1-2 teaspoons (depends on pan size and non-stickness) of oil over a medium flame. Take the jug of batter, give it a good whisk; add in the soda water or 100ml ‘plain’ water and whisk again. Using a soup ladle add a scoop of batter to the hot pan, tilting as you add , until it is evenly distributed. The batter will be ‘holey’ – this is normal, and desirable even. Fry the crepe for three minutes before laying over one-quarter of the filling onto one half of the crepe. Pop the lid on (if you have one) and let the filling reheat. Remove the lid and, with a spatula, fold the unfilled side over the filled side. Carefully slide onto a herb salad-dressed plate, or onto a baking tray to keep warm in a low oven (100C/212F) while you make the remaining crepes. If you can have two pans on the go that’s ideal, put possibly too stressful! To serve: Serve the crepes over or alongside the herb salad, and with the punchy dipping sauce – plus loads of napkins. 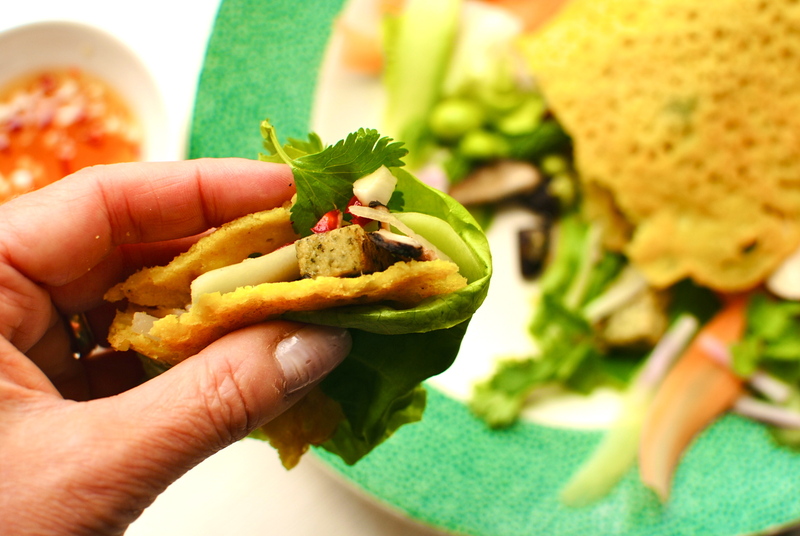 My Miss R likes to use a knife and fork, but traditionally one uses the lettuce leaves and herbs as a wrap to hold the crepe: messy but so fun and delicious! PS you could also serve this with a loosened satay sauce, as well as the nuoc cham. 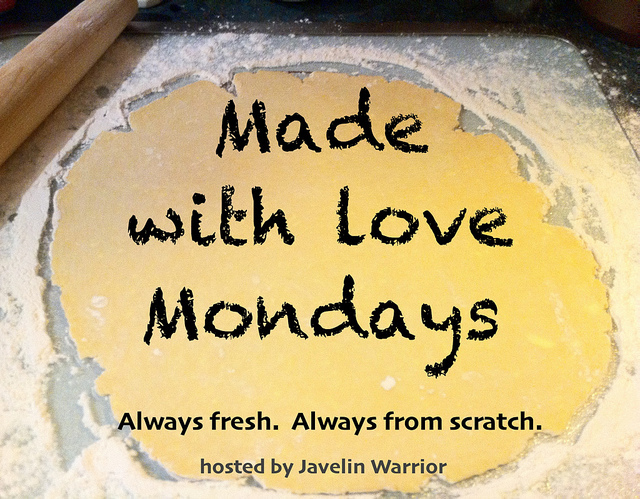 I am sending this over to the fragrant Karen at Lavender and Lovage for her Cooking With Herbs challenge, as well as to the always-accommodating Mark at Javelin Warrior Cookin’ W/ Luv Made With Love Mondays. Please go and visit for loads of herby and made-from-scratch delights. Oh these look and sound AMAZING! Big fan of Vietnamese food but can’t say I’ve actually ever made any (hanging head in shame). These pancakes look fragrant, fresh and FAB! Gosh, you must have been sitting at your computer (phone? tablet?) just as I published! Thanks so much for being my first commenter (always a relief! ), and such a nice one too. I was! Just turned the reader on and there was your fabulous post! My love affair with Malaysian cuisine began in 1998 when I lived there, and just about everything else became only a close second. I still feel this way though the last local Malaysian restaurant closed its doors here 4 years back. I will wait, My Love, for your return! I so miss you Kellie. Blogging has moved down on my list a few numbers, but I’m still a huge fan nevertheless. I see that you’re still cranking out damn good content. Keep it up. If I’m gone, it might be for long, but not forever. Have a great summer! Oh…and YUM. I can see how this scratches all your itches. I’ll stick with the tofu. And I won’t attempt in my tiny apartment kitchen. Will have to wait until the new kitchen is in. I thought you were still kitchenless – poor you! Try and find a Vietnamese restaurant as this is bound to be on the menu and I’m sure they would leave out the animal bits for you! Oh, my! Everything about this looks wonderful – the crisp, crunch crepe, the luscious filling . . . and that dipping sauce! The final photo of the crepe cradled in a lettuce leaf is the real clincher. Aw thanks so much 😀 The texture and flavour are quite good, and easy to make if the prep is done. It’s funny you like the last image as it is my wrinkly old hand. Kind of makes me wish I knew Photoshop! Thanks you anyway. I should stop being so paranoid or let my daughter do more shots like that! Funny, Kellie, I have the same phobia about my hands being photographed. Maybe we should both just get over it. Riding a bicycle year-round and washing my hands 120 times a day have taken a toll as well. I’ll promise to think about it! My daughter wants to eventually go into music production so she knows her stuff. Even if the streak doesn’t continue we are still thrilled to get such amazing feedback thus far. Although we are only three of us, the house thrums with music, either from an instrument or the internet. Enjoy your choices! Good to hear your son is a keeper. I wonder if he knows how close he was to being traded! What a wonderful dis. A delicious crisp pancake packed full of goodies that I would love and always love a dipping sauce such as nuoc cham. I think you are right, kids could enjoy food like this as they could just chose what to stuff their own pancakes with and in fact they seem to love crunchy veggies that have just been fired briefly. So do I! This looks wonderful. I can’t wait to try it out. Your questions on what food/s set you alight made me realise I had forgotten some stars. My first thought was Vietnamese, but then you mentioned Malaysian, then Thai sprung to mind and my mouth started watering. Thank you for piqueing my memory and reminding me of all the wonderful quisine’s out there. Kellie this looks and sounds delicious! I would like one right now for brunch! Interesting recipe that you have developed here. I could probably make one of these with buckwheat perhaps? Vietnamese is among my favourite foods…. right now I have a thing for soft shell crab! Buckwheat, but Urvashi (Botanical Baker) mentions chickpea. This recipe may be a bit summery for you now but I’d like to think it would make you feel like you are on holiday. I hope you are continuing to get better. So frustrating when the mind is ahead of the body! at the moment vietnamese is my favourite cuisine! i am absolutely crazy about fresh summer rolls, a delicious cary (as they call their curry), rice noodle b owl with 1 zillion toppings or crepe. i have actually never ordered the crepe myself but seen it on tables next to me and have been thinking about getting it next time and then next time.. etc u know how it is.. i keep sticking to my favourite things and should actually try a crepe at least for ONCE! anyways urs def sounds amazing and so easy to make! i am a big fan already and will make it at home as soon as possible!! Oh, first get it at the restaurant for the real experience (preceded by summer rolls!). My recipe is way veggier than is usual but that’s the great thing about making something yourself. You can customise to your heart’s delight without looking like a fusspot. Sounds pretty amazing! I have a major food crush on all foods that are East Asian! I think there are a lot of us out there. And are you very surprised there is no egg in the batter?…This would be such a great dish with all your home grown goodies. How are those cukes coming on? Yes, no egg…who would have thought! Fantastic recipe Kellie! 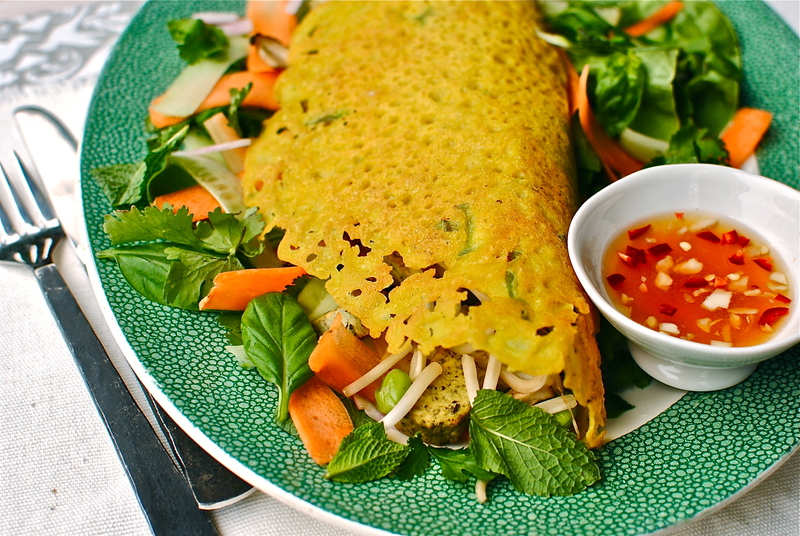 I’m a huge fan of Vietnamese cuisine and although I’ve eaten the crepes in restaurants, I’ve never thought to make them at home. Yours looks so fresh and full of flavour. I feel better already for just looking at it! Tried to comment earlier today, but it wasn’t letting me….All I can say now, is that these crepes look absolutely amazing!!!! Thanks EA. Loving your melon mojito recipe! Thank you, Phuong. I suspect you are being kind but I’ll take the compliment anyway! 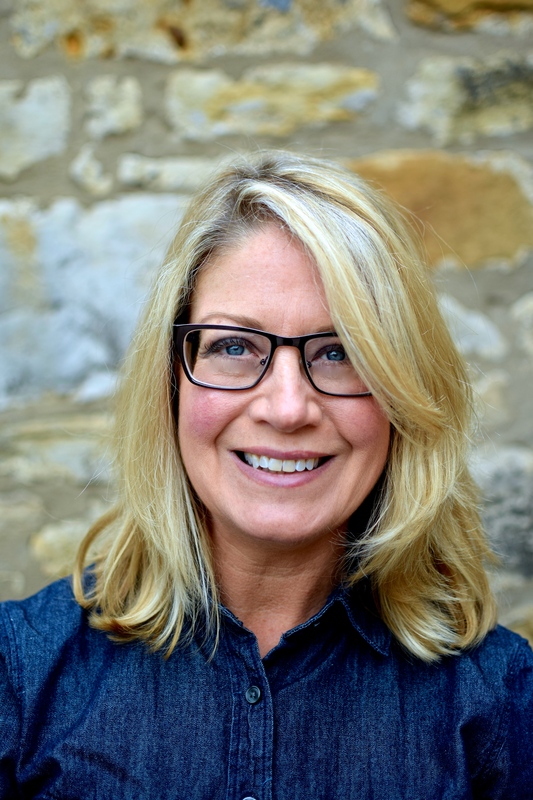 Hi Kellie, I absolutely adore Vietnamese food – it’s my favourite Asian cuisine. I’ve had these pancakes in Hue, where they originate, and they were fantastic. Wow, I’m really excited to try these I didn’t realise they were gluten free. More importantly they look religious, thanks for the recipe! Kellie, I don’t know if you can tell, but my husband is out of town for a few days and I’m trying a bunch of your recipes. Yesterday it was the Jerk Paneer. Tonight I made these crepes. I liked them very much. I love the way your recipes have tons of flavors and textures (crisp radish, smokey cilantro, smooth tofu, etc.). In the crepe recipe, I have one question, Either you or one of your responders mentioned crisp crepes. Were they supposed to be crisp? Mine were tasty but they were not foldable like an egg-based crepe. They reminded me more of a cici-flour based crepe. Maybe I didn’t cook them long enough? I added plain water, not the soda water – would that matter? I’m at 6000 altitude, but I doubt that would matter…….. 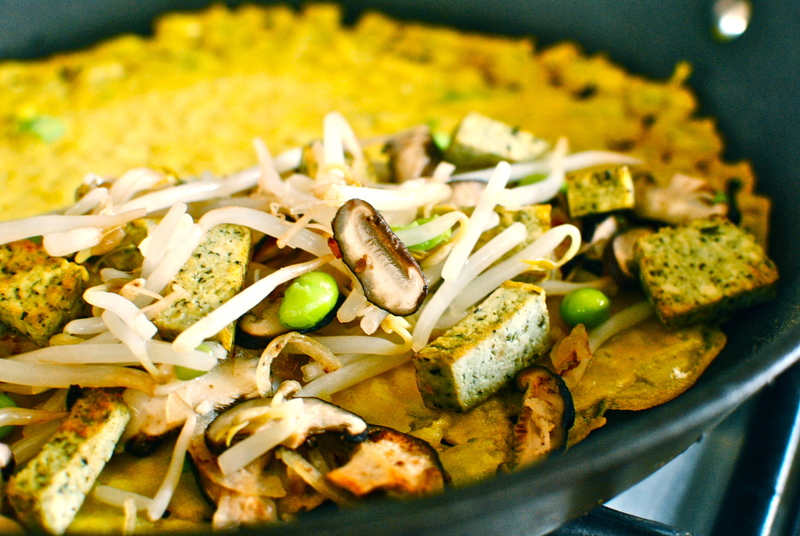 Tomorrow I’m making Indonesian Tofu Fried Rice.